Nosebleed - What is it and why do the happen? PLUS How do I stop the blood? A nosebleed is the loss of blood from the tissue lining the nose. The lining contains rather small blood vessels that can bleed easily. They mostly occur in the front part of the nose commonly from the nasal septum which is the tissue that separates the nostrils. Capillaries, or very small blood vessels that are inside the nose may break and bleed. This usually only involves one nostril. Bleeding further back in the nose is usually due to a rupture of a local artery or its branches. Blood from the back of the nose flows down the throat even if the person is sitting or standing. This type of bleeding is often prolonged and difficult to control. It can be associated with bleeding from both nostrils and with a greater flow of blood into the mouth. This most often occurs in older people with high blood pressure or people who have had facial injuries. Bleeding from the nose is common and rarely dangerous unless prolonged and heavy. 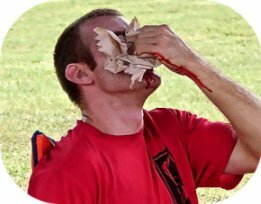 If you need First Aid info for stopping a nosebleed click here. If you have recurring nosebleeds you need to see your doctor to find out what the underlying cause is. Being familiar with why it is happening will not only help you be more informed about your health but hopefully eliminate the disturbance that nosebleeds cause to your daily life.